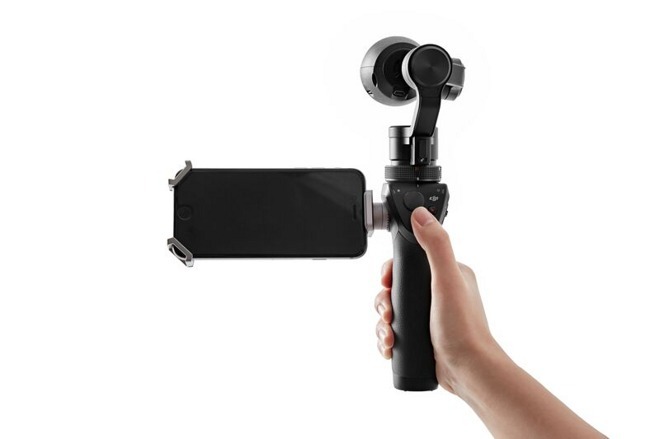 DJI on Thursday unveiled the Osmo, an integrated 4K camera and handheld three-axis stabilizer that connects to Apple's iPhone for even greater control and capabilities. 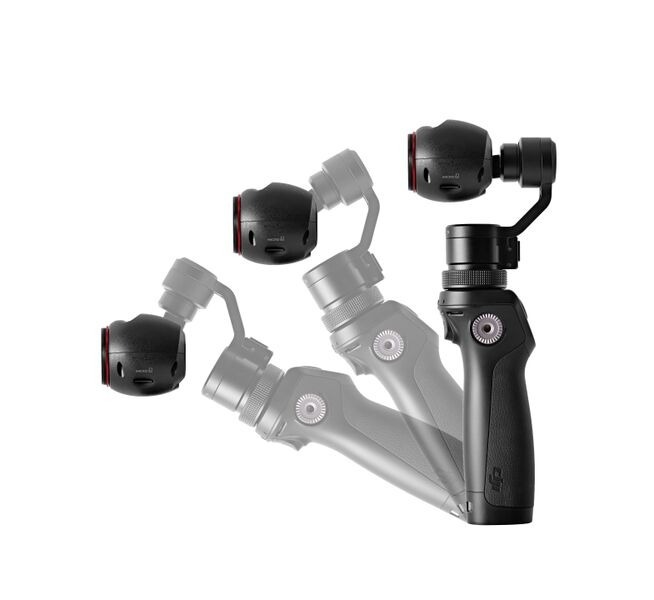 The DJI Osmo uses the company's three-axis gimbal stabilization technology found on other devices, like its Phantom drones, to eliminate the shake found on traditional handheld cameras, like a GoPro. DJI says its new product, priced at $649, makes it easier than ever to get super-smooth cinematic shots on the go. The device comes with a standard 4K, 12-megapixel camera with a 1/2.3-inch sensor and a 94-degree field-of-view lens. The modular format is also compatible with DJI's Zenmuse camera series found on the Inspire 1 drone, including a Zenmuse X3, Zenmuse X5 Pro, or Zenmuse X5 Raw. Using the DJI Go app for iOS, which also allows live viewing of Phantom drone footage on an iPhone or iPad, users can view live images from the camera, adjust settings, and control smart filming functions. The iPhone mounts onto the side of the gimbal's handle, where it can be adjusted for viewing from a variety of different angles and ways of holding the camera. When connected to the iPhone app, users can choose between shooting panoramic pictures, long exposure images, and slow-motion shots at 120 frames per second up to 1080p resolution. The Osmo also works with optional accessories like a tripod, a bike mount, or an extension arm. Other accessories include a universal mount for external microphones or an LED light, and an arm that allows two accessories to be mounted to the Osmo at the same time. In addition to iPhone controls, the unit also has intelligent controls built into the handle, which allow users to change between shooting angles, capturing photos, and recording video. The unit also has an on-board stereo microphone, and a 3.5-millimeter audio jack for professional-quality external sound. "DJI consistently refines the way cameras move in space - whether they are in the air or on the ground," said Frank Wang, DJI CEO and Founder. "With the Osmo, we have created a camera specifically designed to capture a smooth moving image regardless of filming conditions." The Osmo is scheduled to begin shipping next week, on Oct. 15. DJI hasn't announced pricing on the camera-less Osmo model, which will allow users to bring their own Zenmuse cameras with swappable lenses. "Traditional handheld cameras are either shaky, or require bulky stabilizers that are difficult to set up," said Paul Pan, DJI's Senior Product Manager. "The Osmo moves the experience of handheld filmmaking from capturing what happened, to sharing expressive, smooth video that shows what an experience was like."